View More In Bimini Tops. 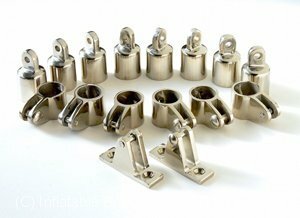 BIMINI FITTINGS SET - 4 Bow 16 pieces... Set Consists Of: 8 Each - Eye End Cap... 6 Each - Jaw Slide... 2 Each - Deck Hing 90 Degree. For 1" tube... PLEASE NOTE: Other sellers offering a similar item under our brand name, Inflatable Boat & Marine are not supplied by our company and we offer no guarantee for their product. Polished to a beautiful, mirror-like finish. 4 Bow - 16 Piece set for 1" tube as pictured. If you have any questions about this product by Inflatable Boat & Marine USA, contact us by completing and submitting the form below. If you are looking for a specif part number, please include it with your message.